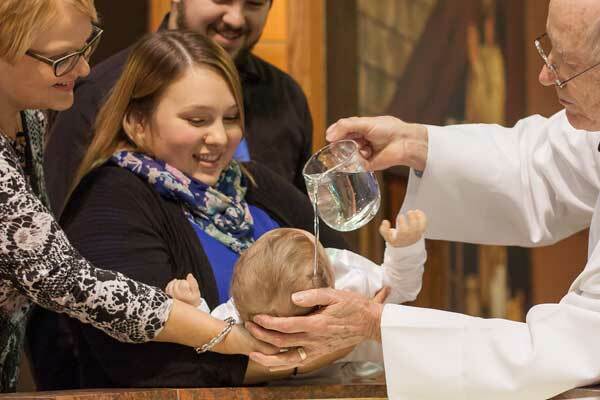 The sacrament of baptism initiates us as members of the Christian community and is the gateway to the other sacraments. The water used at baptism recalls Jesus’ own baptism by John the Baptist in the river Jordan and symbolises cleansing and renewal. As we begin a new life as a Christian, we are washed clean of sin. The blessed oil is used to anoint the person being prepared for baptism (known as the catechumen). As an ancient symbol of power, the oil of catechumens strengthens the person for their life as a Christian. Through the centuries, oil has been used as a sign of God’s favour. In the Old Testament, those called for a specific task were anointed with sacred oil. The newly baptised are anointed on the head with chrism to symbolise our calling into Christian life, where we are called to be priest by living a life of prayer, to be prophet by announcing the Word of God and to be king by leading with integrity. At Easter, the Paschal candle is lit as a sign of the risen life of Christ. This life is stronger than death. It cannot be put out but shines brightly in the world as a sign of hope, strength and love. At baptism, a small candle is lit from the Paschal candle for each of those baptised. Handing the candle over, the priest says, Receive the light of Christ. For the baptism of children, parents are then instructed to keep the light burning brightly and the flame of faith alive in their child’s heart. The person being baptised is dressed in a white garment to symbolise the absolving of sin and a visible sign of Jesus’ light and life. To arrange a baptism, please contact St Mary’s either by phone or send us an email via our Contact page.